“In this discredited perspective, peace will happen only if Israel surrenders more. But the opposite is usually the case,” said Tooley. Released last week, the joint statement was signed by representatives of 15 churches and Christian organizations and called for, among other things, an end to Israeli soldiers using deadly force, an investigation into deaths and injuries suffered during the protests, and an end to Israel’s blockade of the Gaza Strip. “The Gaza demonstrations are an assertion of Palestinian rights: the rights of refugees, the right to demonstrate peacefully against injustice, and the right to live in and with dignity, not under closed military confinement or blockade,” read the statement in part. The groups that signed the joint statement include the Alliance of Baptists, American Friends Service Committee, Christian Church (Disciples of Christ), Evangelical Lutheran Church in America, Friends Committee on National Legislation, Maryknoll Office for Global Concerns, Mennonite Central Committee U.S., National Council of Churches, Pax Christi International, Pax Christi USA, Presbyterian Church (U.S.A.), Reformed Church in America, the United Methodist Church’s General Board of Church and Society, the United Church of Christ, and The Episcopal Church. 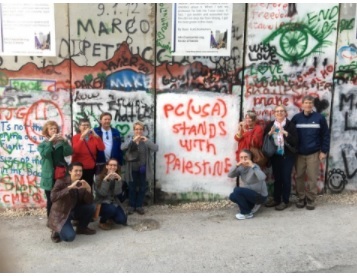 “The Episcopal Church’s General Convention has repeatedly rejected or declined to consider resolutions that call for the church to divest its financial holdings from companies that do business with Israel,” explained Walton.